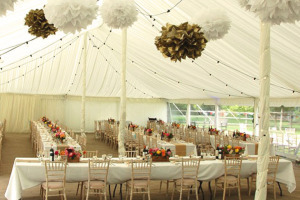 As one of the most reliable and affordable marquee hire companies in Boland & Overberg, we strive to ensure that all our clients get the best service at affordable prices. With a large stock of tents of all shapes and sizes, you can be sure there is something suitable for you. Allow us to make your event an unforgettable occasion and call our tent hire team today! By choosing us to work on your project, you get a wide variety of fashionable and robust tents. Our team offers delivery and assembly services and are at short notice, should suddenly find yourself in need of a tent. All the equipment and tents in our premises are of the highest quality and can be installed on any terrain. Our team always pays close attention to detail and ensure all safety requirements are met. Let our tent hire Boland & Overberg team do all the hard work for you – call us today! Whether you are planning a garden party or a large outdoor wedding, we have the solution for you. We are also available for drapery and linen hire services, along with gazebo rentals for smaller functions. Do not wait any longer, call us on 021 300 3641 and we will make your event a success!